What’s petite, round, and has no arms or legs? You guessed it: Mini Fibrous Apple Crisps! The “fibrous” part of the title says it all – each of these babies has around 5 grams of fiber. Not too shabby for apple crisp, eh? I can read your mind; you’re wondering what the catch is. Anything fibrous with a dessert-y name must certainly be too good to be true. And that is where you’re…well, mostly wrong, but the slightest wee bit right. There is a grain of truth to that statement. The Fiber One “crust” on the bottom turned out to be more of a “grainy sand-like crumble.” But, when these apple crisps are served atop vanilla yogurt in a parfait, or garnished with ice cream, it hardly matters. Anywhoozlebees, it’s time to get our apple crisp on. Preheat oven to 350 degrees F and grease 6 out of the 12 cups in a muffin pan. 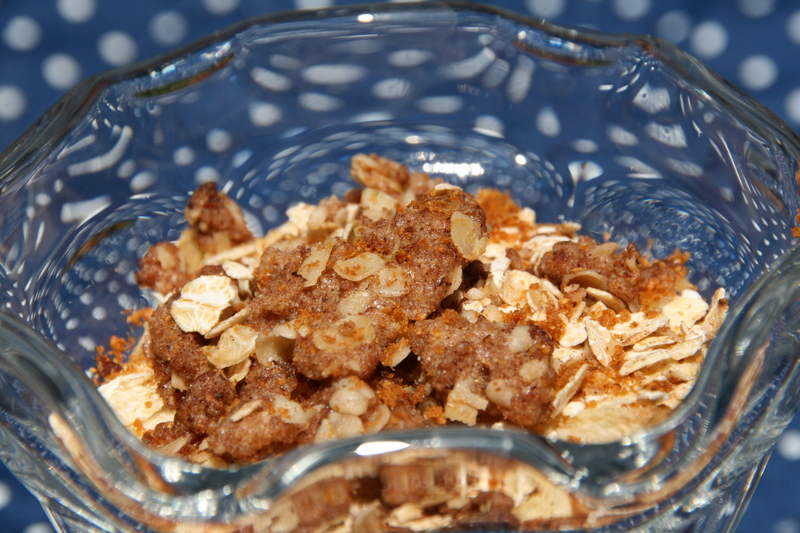 Place cereal in a blender or food processor and grind until it becomes a crumb-like consistency. Put in a bowl and set aside. Pour melted butter over Fiber One crumbs and mix well. Distribute crumb mixture evenly into 6 greased muffin tins. Press firmly onto the bottom of the tins with your fingers or some other utensil. Once finished, set muffin pan aside. Once apple is peeled, quarter it, halve these slices lengthwise, and then halve these slices lengthwise again. Then cut them all in half so that you have about 1-inch long, thin, half-slices of apple. Combine flour and brown sugar in a small separate bowl. Cut in butter until mixture is in small chunks. 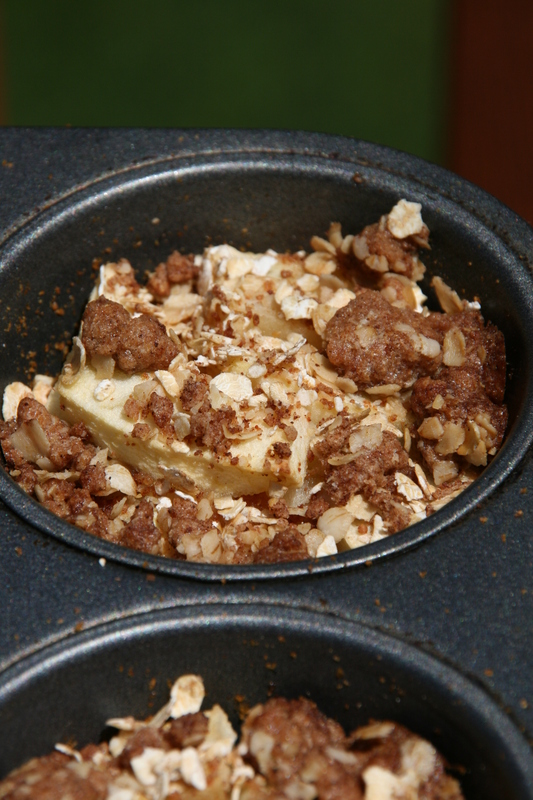 Distribute crumble evenly onto the apples. Bake crisps for 35-40 minutes, or until apples are tender. Remove from oven and allow them to cool for a few minutes. When ready to eat, carefully remove the desired number of crisps (some of the crust may not come out with the rest of the crisp) and serve with vanilla yogurt or ice cream!